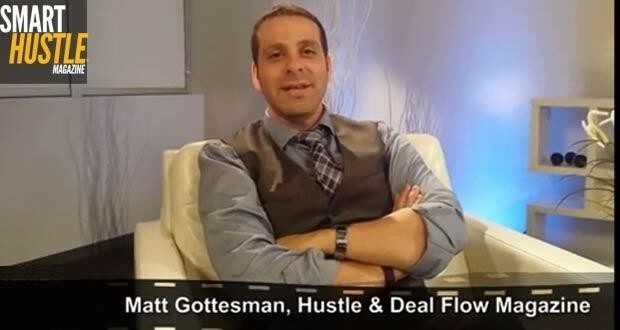 Matt Gottesman knows a thing or two about what it takes to hustle your way to success. As the Editor and Founder of Hustle & Deal Flow Magazine, Matt uses the magazine to tell the behind the scenes story of entrepreneurship. Through candid interviews of entrepreneurs around the world, Matt is able to share the journey, including successes and failures of what it takes to hustle to the top. As many of us know, becoming an entrepreneur can be one of the most challenging and yet most rewarding experiences of our life. We are driven by a passion for our business, the determination to deliver and the desire to succeed. That's why in this exclusive interview with Matt Gottesman, we asked him to share his insights on what it takes to be a 'Smart Hustler'. Find out some of Matt's key tips to scaling your way to the top by watching the video below! Watch the interview below to hear Matt's tips, or simply click here.